« ORC Week 4 –They’re Up and Fabulous! You did such a wonderful job in this space! 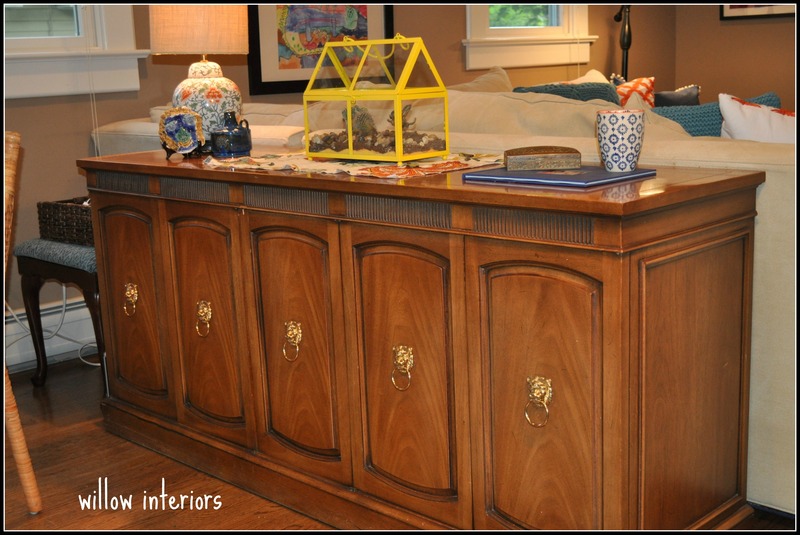 I can’t wait to see that sideboard all done! Navy sounds like the perfect color for it! 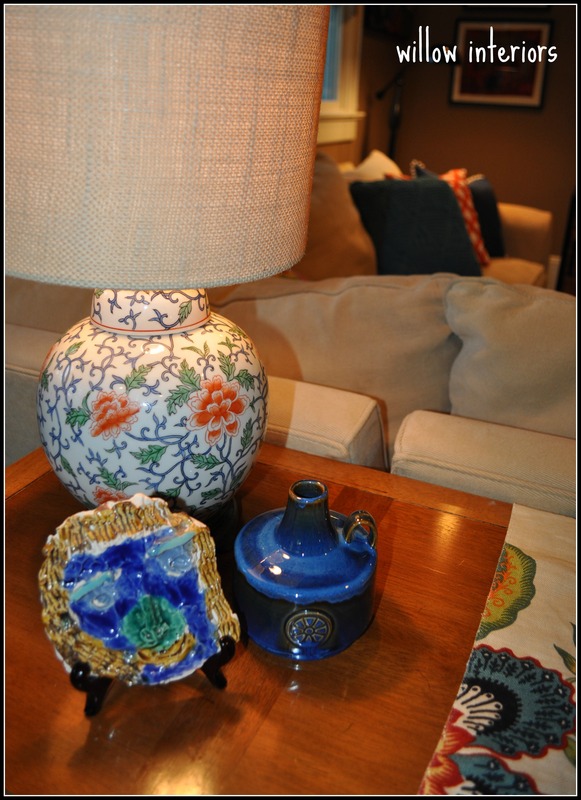 Kate, the inclusion of color brings so much life to your family room!! I’m in love with your bold curtain fabric, the game table area with the bench, and all your fun art and pillows that make this space so cheerful and fun. Great before and after!!! Enjoy your space. Love the color Kate, and think that console in navy lacquer is going to be the BOMB!! The curtains are so fun and bring such a punch to the room. Congrats! to you AND your son on his confirmation! It’s looks gorgeous!!! 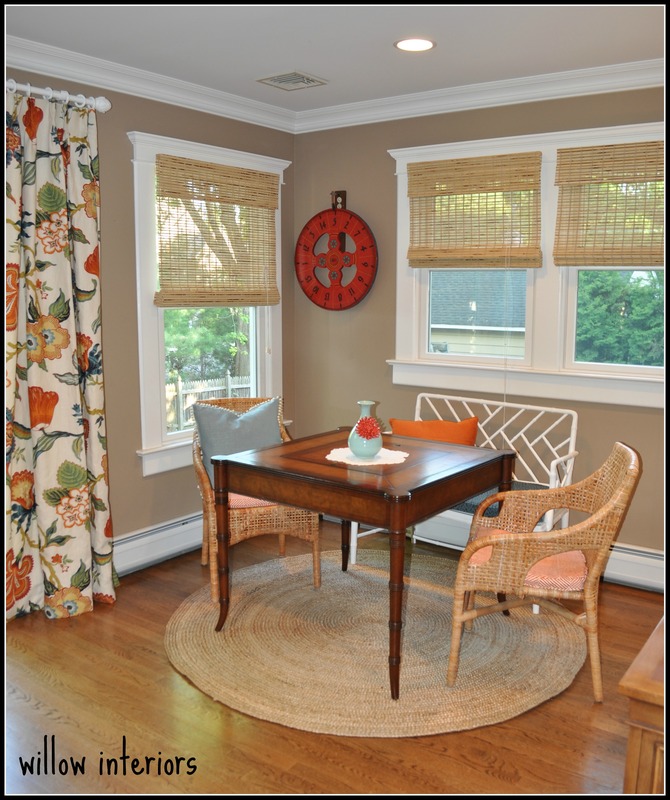 The curtains, the rug and accessories come together beautifully…well done!! 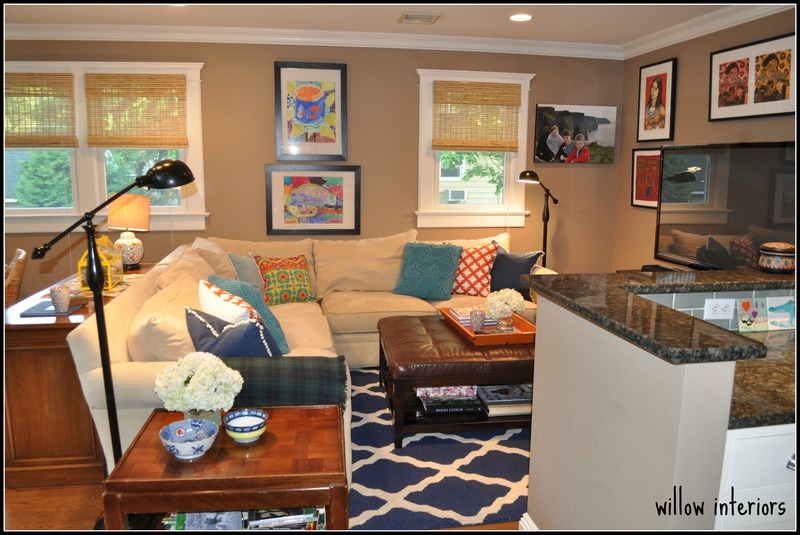 Love the colors in the pillows and the big navy & white rug. Beautiful job! What an amazing transformation! A true job well done. I just love your drapery fabric. The six weeks went by so fast. I completed our entry, living and dining areas in a new to us 30 year old house. So, cheers to us! Have a wonderful weekend. tara // by design co.
What a fabulous space. Especially love the window treatments. What a great space for your family to enjoy! I love the transformation! What a beautiful space to live in everyday! Congratulations!! I just love all the bright and pretty fabric choices. I can’t wait to see that piece lacquered! How interesting! And congrats on your little boy’s first communion. We have to wait another year! What a change from when you moved in! Congrats! And Congrats on the first communion! 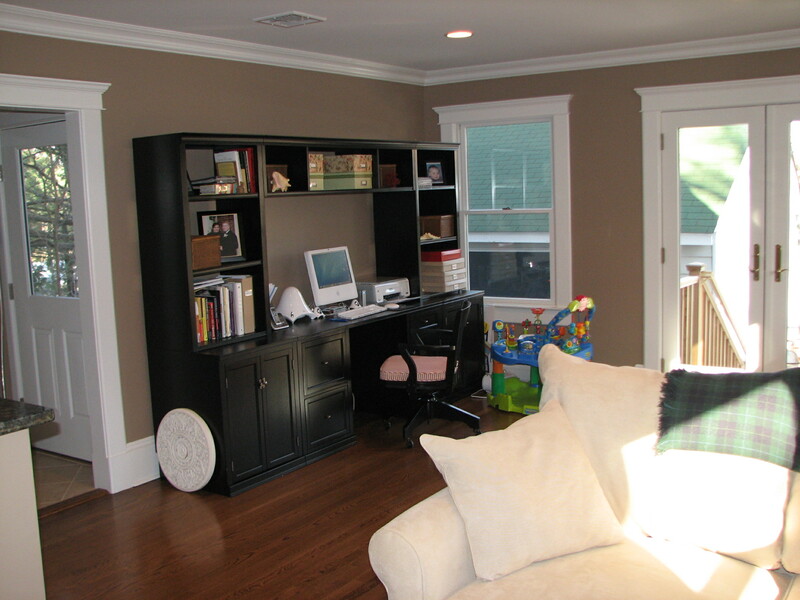 Your space looks so fun and perfect for a large family! I love the game table area… wonderful job! 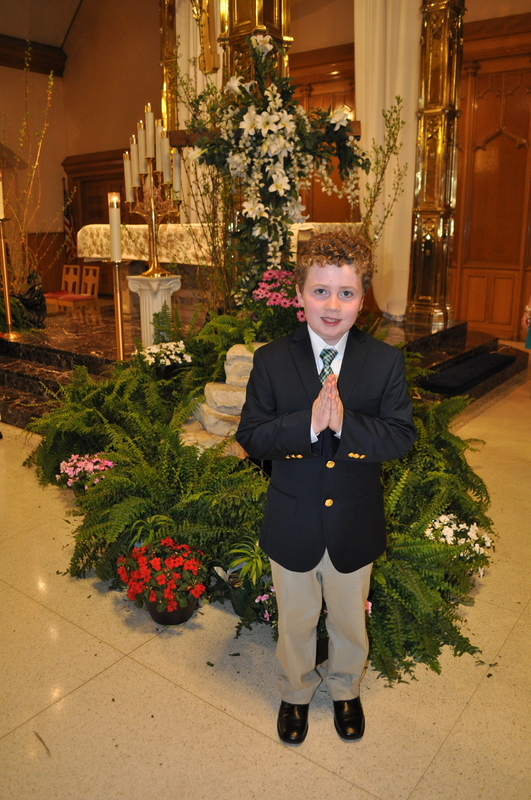 Congrats on that handsome little guy’s 1st communion! I bet he was proud to show around your new family room which is amazing!!! Great job! What a fabulous room for your family, I love that chippendale bench! The Parker Kennedy boys are amazing, your sideboard will look incredible! Great job! Those drapes are such a happy focal point! 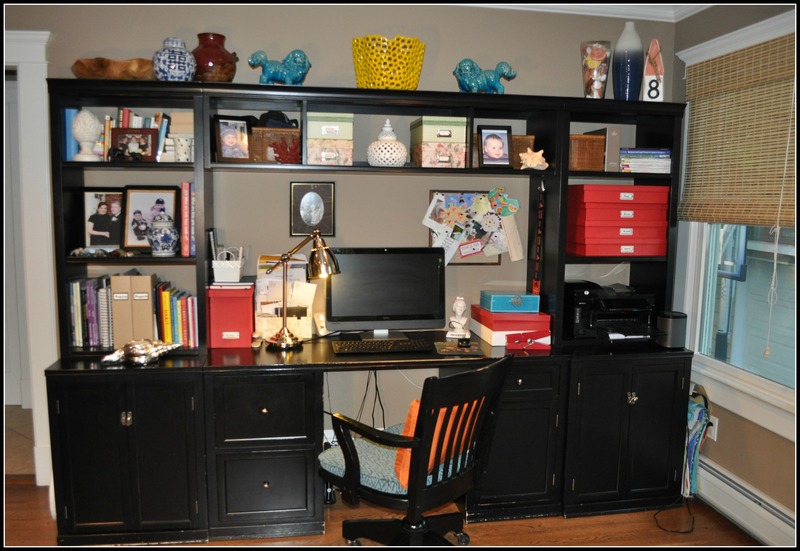 Love the different areas you have set up in the room. This looks like a very relaxing space! Love it! And congrats to your adorable son!!! Enjoy your new room ! Those drapes are gorgeous! I love the addition of color…good job. This room is so fun! The draperies are everything and the pillows on sofa — so fun!! You found some pieces with real character and potential. I can’t wait to see what you do with that sideboard – love the hardware already. I love a room with a game table – I’ve sold a couple of clients on that recently, and they’re not going to regret it. Great choice on the drapery fabric, especially. Congratulations!! What a beautiful space & those drapes are to die for! 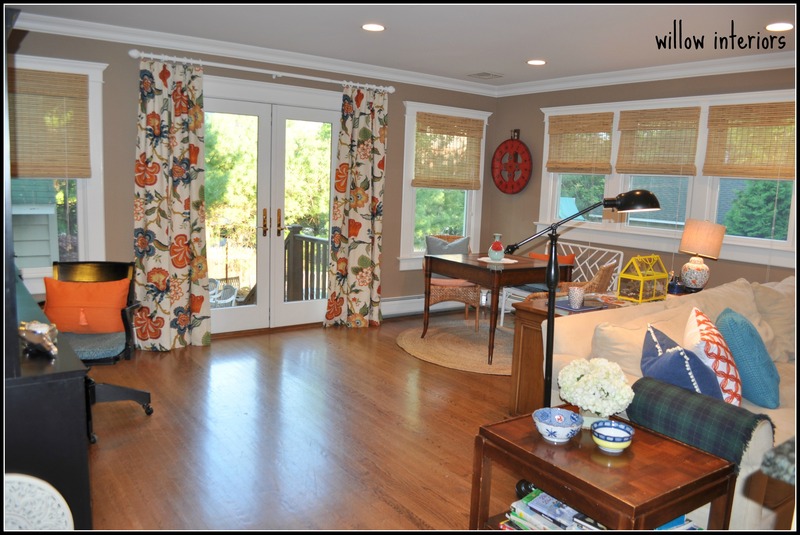 I love how you were able to just them on just the french doors and incorporate the natural fiber blinds on all your windows. Looks gorgeous! Wow! What a transformation! Can barely even tell it’s the same house! Isn’t it a great feeling to reach the finish line?! Congrats on giving you family a great new space!! Kate, this is perfectly styled. I love that rug, btw. Your family will have some great gatherings, here. I love the way you mix pattern and color, too. Yay for another one. What a great makeover! 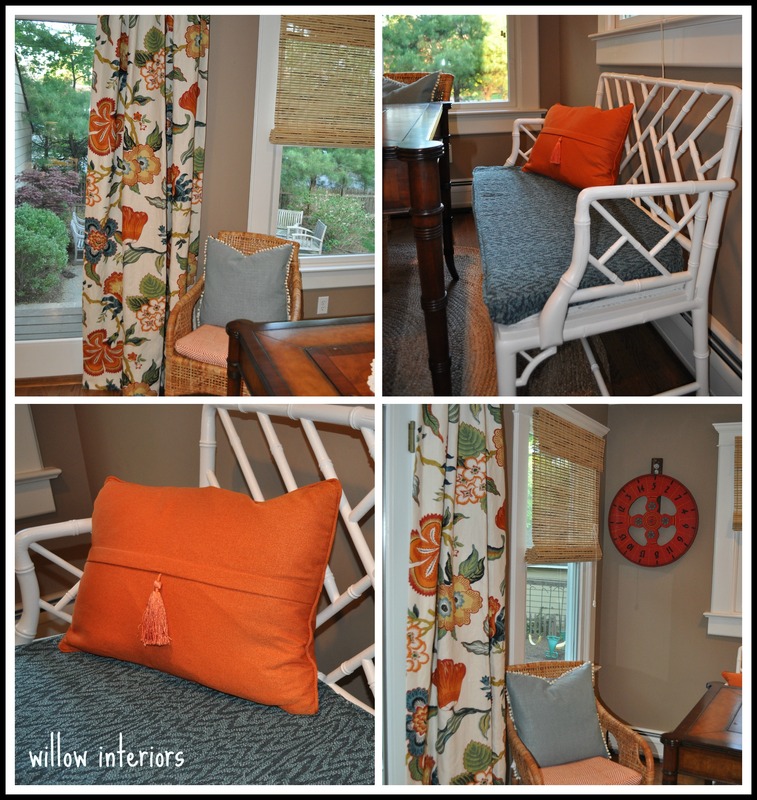 Love all of the color and of course WOW for the Schumacher curtains! One of my favorite patterns! Great job pulling this room together! What a transformation Kate! Love the colors & I’m obsessed with your vintage bamboo bench! 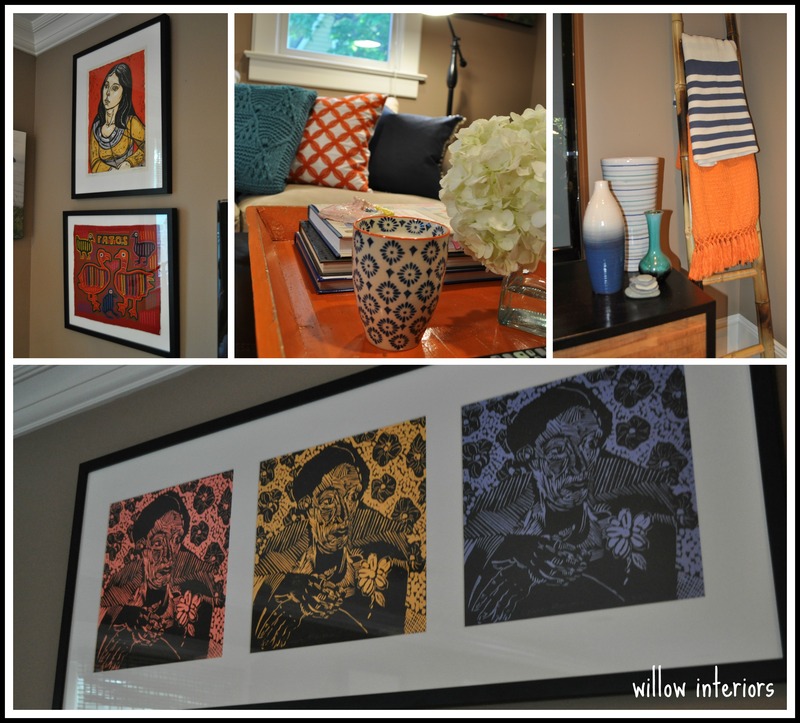 looks amazing – my absolute favorite are you beautiful printed drapes! 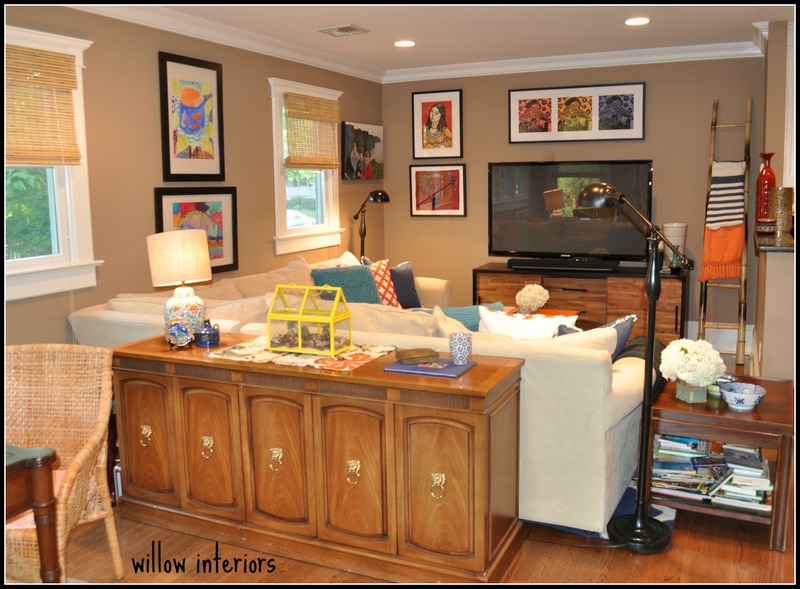 they bring so much to the room, the whole space is just so cozy for your family! great job!